Fort Popham on the Kennebec River in Phippsburg, Maine. History buffs rejoice: Maine is a prime vacation destination for those who love to learn about military history. The state is dotted with historic forts – 25, to be exact – many of which have stood since colonial times. Since early colonial times, Maine’s forts have watched over the state’s harbors, towns, waterways and strategic locations. Many date to the conflicts that raged between the English, French and the indigenous North Americans, while others were constructed during the Civil War. Several of these strategic structures performed double – or triple – duty, serving as centers of coastal defense during the War of 1812, the Spanish-American War and World Wars I and II. Today, many open their doors to visitors. Fort Popham guards the mouth of the Kennebec River near Phippsburg. Construction on this Civil War-era fort began in 1862. The fort was built to protect the Bath shipyards and prevent the Confederate Navy from accessing Augusta. However, Fort Popham didn’t see any action during this conflict, through troops were garrisoned there during the Spanish-American War and WWI. Though the fort was never completed, it was constructed of granite stone quarried from Dix and Fox Islands and features 36 cannons on two casement levels. Today, visitors can tour this semi-circle-shaped fort from Memorial Day through September 30. The fort grounds contain picnic tables; visitors can also go fishing or beachcombing in the area. Just across the Kennebec River from Fort Popham, Fort Baldwin encompasses 38 acres. Though it’s named for Revolutionary War engineer James Baldwin, this fort was built between 1905 and 1912. The fort was garrisoned in WWI and II. 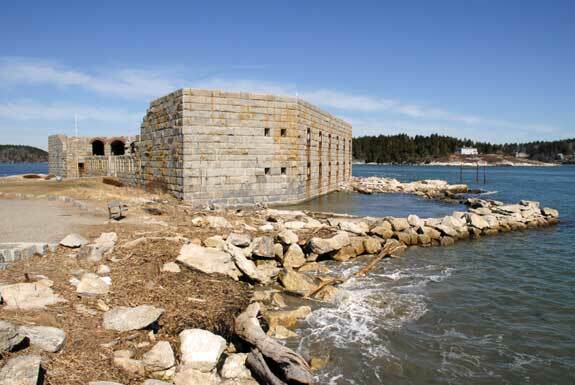 Unlike Fort Popham, which it was built to replace, Fort Baldwin is made of concrete. It originally had three batteries and still has a WWII-era observation tower. Built in 1682, Fort William Henry at the Pemaquid settlement was considered an engineering marvel in its day. The fort occupied a strategic position at the edge of the Massachusetts colony, and then-governor William Phips spent 2/3 of the colony’s funds building this rectangular stone fort in an effort to strengthen England’s tenuous hold on the area. The fort, which has 22-foot walls and a 29-foot bastion, housed 20 cannons and 60 soldiers. However, an 1896 joint attack by the French and native peoples overwhelmed Fort William Henry, and the British abandoned it soon after. About 100 miles from Portland, Fort Knox is Maine’s largest historic fort. Built during the Civil War, this granite structure on the Penobscot Narrows was garrisoned during the Civil and Spanish-American Wars. Designed by Joseph Totten and constructed between 1844 and 1869, the fort was named for Secretary of War – and Maine resident — Henry Knox. Today, the inside of the fort is open from May 1 through October 31. The grounds, which are open year-round, contain many pleasant picnic spots. Visitors can also take an elevator to the top of the nearby Penobscot Narrows Bridge Observatory. New England’s oldest surviving wooden fort, Old Fort Western, dates from 1754. Overlooking the Kennebec River at Augusta, this National Historic Landmark was used by Benedict Arnold during the Revolutionary War. After 1767, it served as a storehouse and as a private residence. This well-preserved fort is open to visitors year-round. It houses a museum and gift shop. Another National Historic Landmark, Fort Halifax, sits on the Kennebec at Winslow. The fort originally contained four blockhouses and barracks. It was built in 1774 by English colonists to defend the region from both the French and the native population. The fort was established as a military base by General John Winslow. A flood destroyed much of the structure in 1987 but visitors can still explore the lone blockhouse — the country’s oldest — that remains. Fort Kent guards the confluence of the Fish and the St. John Rivers. Built during the 1838 conflict between England and the U.S. known as the “Bloodless” Aroostook War, all that remains of Fort Kent is a two-story blockhouse. The fort housed federal soldiers until the 1842 Webster-Ashburton Treaty ended a dispute between New Brunswick and Maine. Now, this cedar-log structure is a National Historic Landmark and is on the National Register of Historic Places. It contains a museum and visitors are welcome daily between Memorial and Labor Day. Maine’s historic forts offer a glimpse into the state’s rich past.